Tonight, as I stand outside my house holding onto the dog’s leash, I can see a narrow beam of white light in the distance, piercing upwards through the veil of clouds into the heavens. It’s 9/11. 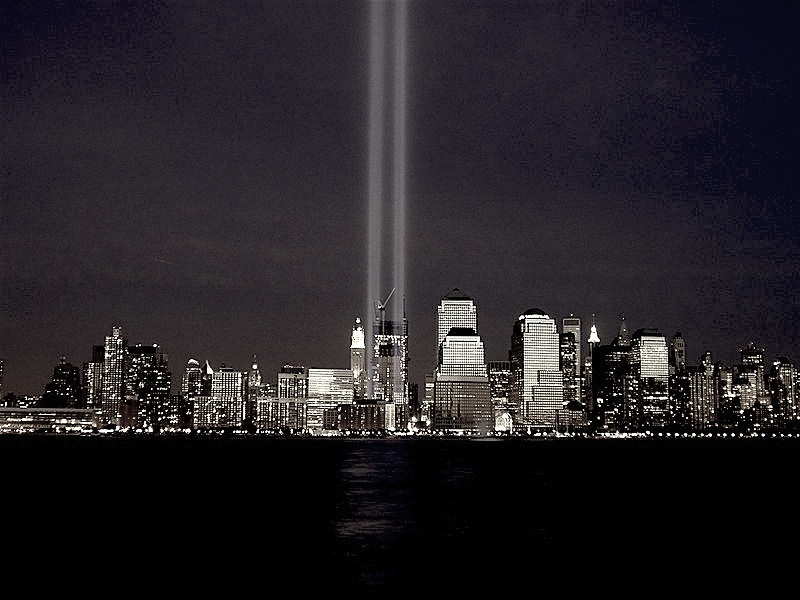 That beam of light in the distance emanates from Ground Zero. Nine years ago, we were recent transplants from New York City, where I had never needed a car, to the Garden State, where evidence was mounting every day that not knowing how to drive was a tremendous liability. I was running late. Looking through the picture window, I could see that it was a warm, sunny day. Rosh Hashana was a week away, cars were parked up and down my street as men gathered to pray at the nearby synagogue. My daughter had just boarded the bus for her fourth morning in Kindergarten at a school five miles away, and I was struggling to buckle my two boys into a single stroller so that I could get to nursery school. Upon my return, dozens of moving boxes would demand my immediate attention, as would my youngest, who was exactly one year old. Understanding comes to me slowly. “It must be terrorists,” I say. Still, pre-K. I’ve already paid for it, this is all happening miles away, we might as well go. In a changed world, I push my little one to his new school, then quickly return to the playroom. I switch on the TV. The images are famous now, the thick gray smoke streaming in the wind, the people hanging out of the windows, the gaping wounds in the building’s sides. In the absence of any real information, rumors circulate. We hear that jets are still in the air, headed for we-don’t-know-where. We hear that the Pentagon has been struck. We hear that there’s a plane somewhere over Pennsylvania. We hear that the George Washington Bridge has been wired with explosives. Fear claws at my heart as I realize what this means. America is under attack. The reporters look grim. We have yet to hear from our government. Are the planes on their way to Chicago? To the White House? What is going on? My first instinct is to pick up my children from their various schools and flee, or at least, have them near me. I can’t, of course. I don’t have a car and I don’t drive. My husband works in Brooklyn. He will have to drive through the City, across the many bridges and tunnels, to reach us. But Manhattan is closed. No one can get in or out. I am alone. I don’t know when I’ll see Jon again, and I can’t get him on the phone. That’s when the phone rings, the sweetest sound in the world. My heart leaps; it’s him, it’s him, thank God it’s him. “I’m standing at my window, watching the World Trade Center burning,” he says. I return to the TV. The minutes crawl by. I am waiting for any kind of good news; the fire’s out, everyone’s safe, we caught the nasty buggers who did this. Without warning, the first building disappears in a puff of smoke, like a magic trick. At first, I am not sure what I am seeing. It’s a grainy gray picture, and all I can be sure of is that there is smoke. But the smoke slowly clears off, and I realize that the building just isn’t there anymore. Tears spring to my eyes. It never occurred to me that the building might collapse. How could it? The World Trade Center is a massive monolith, holding dominion over the skyline. It was the first thing you looked for when you emerged from the subway, to orient yourself. How could one little airplane destroy such a giant? Forty minutes later, the other building shifts a little. I watch with a hand pressed to my mouth as the antenna sinks out of sight, and then the whole edifice slides silently downward, and we are left with a pillar of smoke. When it dissipates, slinks away, the sky is empty, a raw, naked cerulean blue. It is 10:28. This is when we lose our communications. The television stations, the radio stations, the telephones, all of them transmitted from that one pulverized antenna. The buildings are gone, but I cannot tear myself from the TV. I don’t know why; Perhaps I am waiting to find out that this has been a dream, or perhaps I keep waiting for someone to tell me what to do next. For the first time, I wonder if anyone was inside. I assure myself there was plenty of time for everyone to have been safely evacuated. Unaccountably, the Verrazano bridge opens for a short while at 3:00. Since the phones aren’t working, I wonder if Jon is on his way home. I am terrified; what booby traps are still ahead? What will explode next? I wonder if I should have told him to stay at work. But an hour later, I hear the front door open and close, and when he comes up the stairs to the playroom, looking haunted, I seize him and don’t let go. He tells me it was like driving through a ghost town; there was no one else on the bridge, a busy New York artery usually clogged with cars. He describes for me the cloud of smoke that hovers over lower Manhattan like a shroud, and will remain that way for weeks. For the next few days, whenever I check into our community web ring, someone is frantically seeking any information about a man named Alan who worked in Tower 2. A week later, I scroll over the subdued announcement of his memorial service. We begin to hear our friends’ stories; I worked on the 82nd floor, I was saved because I was at morning prayers. I got to work, and when I saw the flames, I turned around and got right back on the ferry. September 11 was supposed to be the first day in our new office in Tower One. A guy on my floor is alive today because he was fired yesterday for sexual indiscretion. My other brother is an emergency room doctor. He tells us how the ERs geared up for the masses of injured, and how nobody ever came. A few days later, he would volunteer at Ground Zero, treating firemen and construction workers among the blown out, deserted and dust-coated display windows. He describes the smell of burnt metal, the mud, and the Potato Chip, the surreal last remnant of the blasted Trade Center facade. He describes a storefront with the word “Morgue” spray-painted onto it. I don’t really have a 9/11 story, only this, everyday life. On September 9, 2001, we took the kids to the Liberty Science Center, directly across the Hudson River from downtown New York. As we left the parking lot, we saw a double rainbow cross the sky, right above the Twin Towers. We pointed it out to the kids; it was a glorious sight. Two days later, they were gone. And that’s all. I ask my children if they remember that day. They don’t, but we watch the documentaries together every September 11th, gathered together in the family bed, so that they understand that this moment in history touched all of our lives. Look, Daddy works right there, look, Mommy used to live down that street. Last night, I took them outside to see the beam of light. I want them to remember. I think that day changed all of us, no matter how far away we live. Thanks for sharing.